Chin augmentation using a person's natural fat is a relatively new procedure that involves removing fat from another area of their body and then injecting it into the area of their chin. No one likes a weak or small chin as this can be truly less than aesthetically appealing. Not only can a small chin make a person's face appear to be unbalanced, it can make their facial features appear to be much bigger than they really are. Despite being a relatively new procedure, this form of chin augmentation is rapidly gaining in popularity and is showing a lot of promise. Who Opts for Chin Augmentation? While you might think that only men worry about having a small or weak chin, this is really not the case. A growing number of women are also opting for this procedure, as anyone who feels they have a weak or small chin can benefit from this type of augmentation. The procedure begins by giving the patient either a general anesthesia or a local one based on their preferences and the surgeon's recommendations. Once the patient is sedated, the fat will be harvested from the appropriate donor site. The fat will then be processed on site to concentrate the fat cells and to remove extra oils and fluids. The fat is then injected directly into the chin and used to create the desired contour. After the chin augmentation has been completed, the patient will be allowed to rest for a little while before being sent home. The patient may have some mild swelling and pain for the first couple of days that can be relieved using an over the counter or oral prescription painkiller. The majority of swelling of the chin is gone within 5-7 days, but it can take between 2 to 3 weeks for all the swelling to subside. The harvest site usually has mild bruising and swelling that resoles within 7-10 days. 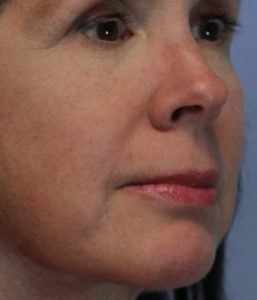 This type of chin augmentation is considered permanent; however, it is possible for some of the fat to be reabsorbed into the body, requiring an additional fat augmentation at a later date. If you would like to learn more about chin augmentation using natural fat transfer, we invite you to contact us at 210-305-5797 and schedule your free initial consultation. During this time, Dr. Taylor will assess your general health and facial structures and then discuss with you your chin augmentation options.